Amongst all the big cats, lions are perhaps the most capable hunters of large prey animals. Despite being lesser than tigers in size and strength, lions take down big prey more frequently than their striped counterparts in Asia. This is largely owing to their social system of living. 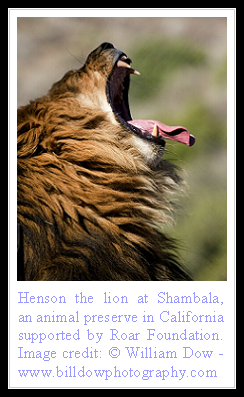 Life in a pride has several advantages and lions are the only cats who have evolved into living in organized groups. As a result they are in a unique position to hunt species many times their size. The first example that comes to mind is that of buffalo. The Cape Buffalo is considered by many to be amongst the most dangerous animals in the African bush and yet lions in many parts of Africa routinely prey upon these one-tonne animals. The modus operandi is to encircle the formidable herd and try and isolate vulnerable individuals. Next the big cats proceed to force their prey into an organized trap laid out for them. Each individual lioness plays a specific role in the hunt, often consistent throughout the animal's lifetime. Still it's never easy to bring down the buffalo and despite the help of male lions, it's still quite a risky undertaking for the predator. The islands of Okavango, Botswana bear witness to the perish of many a lions at the hoofs and horns of the formidable buffalo. And this is not all. Lions in Etosha National Park in Namibia have been observed hunting black rhinos. There are reports of hippo kills from certain parts of Africa and even video recordings of lions actively hunting calves and adults of elephants in Savuti, north Botswana. What drives these great cats to hunt such mammoth creatures? Is it simply depletion of their natural prey in that locality, or is it something more sinister... for many believe that like the buffalo-killing lions of Duba Plains in Okavango, these Savuti Lions have become specialists at tackling their huge foes. Certainly a very interesting and disturbing trend, one that requires further study and understanding. It's fascinating the way the wild creatures adapt. I sounds to me like the lions are adapting their hunting towards the larger animals to compensate for something that is happening with their natural prey. Great article. wow--that's an interesting evolutionary trend to consider, though i don't think i could handle watching footage of it. Have you ever read the book "Beak of The finch"? It's a fascinating journalistic narrative about evolutionary changes on the galapagos in the last 50 years--really well written--i'd recommend it if you're into that kind of thing. also, thx for dropping by my giveaway and offering that great suggestions--I'll have to work on seeing if i can come up with some good tiger drawings for a pendant--i could change my usual animal charity donation from my local shelter to a tiger one too--if you have any suggestions of good tiger charities, I'm all ears. Evolution and adaptation are ongoing. It really is survival of the fittest.I wonder what the future holds with Man taking more and more land too. it is amazing how we kitties adapt. perhaps feral cat colonies are somehow similar. Animals adapt and ultimately evolve at an amazing rate. Something humans will never achieve.